Matthew 25:36 ".... I was in prison, and you visited me." Our prison ministry is a fruit of Bro. Wesley's vision to see broken lives made new by the forgiveness and life changing power that is only found in Christ. He currently visits the East Texas Treatment Facility in Henderson where he does dorm ministry as well as conduct worship services. 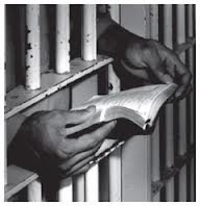 We are currently in the process of assembling a prison ministry team to assist Bro. Wesley in this awesome ministry, and praying that God will open the doors to more facitlities for our team!